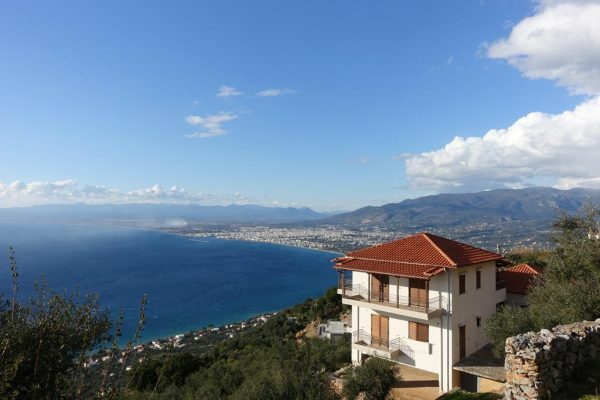 Over Christmas and the New Year I visited Greece – landing at Athens airport then hiring a car to Kalamata. After writing many articles on the economic troubles of Greece, it was interesting to visit in person. Whilst enjoying a holiday, I was always aware – in the back of my mind – the Greek economic crisis and I was looking for signs or anecdotal evidence of why Greece has struggled from an economic perspective. These are a few random observations from my personal holiday. The drive from Athens to Kalamata was on a new highway, built with EU funds, and was in very good condition. But, every 30km or so, you had to stop to pay a variable toll. In total, we must have stopped 8-9 times (though I lost count). As an economist this struck me as inefficient. Labour costs of employing people to collect fees. Time lost to stopping at checkpoint and paying. Slightly annoying, might discourage journeys. The second noticeable issue occurred when paying for expensive items, I was told to pay in cash. One shop, refused payment by card and told me to go and withdraw cash € 130 from the bank. I assume this is to avoid declaring income and avoiding paying tax. It seems there is a deep seated culture of tax evasion. Even with the car hire company (which was very cheap) I didn’t get a feeling the company were straightforward and honest. We ended up with downgrade (smaller) car for same fee. I tried to get a refund for difference, but the owner seemed adept at talking his way out of situations. The company did have poor reviews before we booked, but we chose because it was the cheapest. On the way back to Athens airport, I was struck that – when filling up with petrol, there were two attendants who came out. One to fill up the petrol tank and one to wash your screen. I assume the screen washer was hoping for a tip, I wasn’t sure of the custom. But, again it seems unnecessary labour costs, which increases costs for firms and increases price for consumers. However, this is a lump of labour fallacy. If the Greek government is employing people to sit in toll booths, it could equally employ the same people to do something more productive, e.g. filling potholes, training to be a nurse e.t.c. These jobs would help to increase productive capacity more than the job of sitting in a toll booth making journeys take longer. Rather than employ two people to fill up a petrol tank, it would be better to have lower wage costs, lower price of petrol and therefore give consumers greater disposable income to spend on other goods and services – which would create employment elsewhere. The locally grown food – olive oil fresh off the presses, honey, Greek yogurt were really excellent with a very good energy. It’s a shame the Greeks don’t have their own currency to make these exports more competitive and increase sales. Tourism and agriculture are certainly a strength of the economy. But, from this very unscientific anecdotal experience, it seems there is plenty of scope for supply side improvements too. The fundamental issue for the Greek economy in the past few years is demand side issues. I’m not suggesting supply side reforms could solve the problems of Greece, but it shouldn’t be neglected either. I should also add, Greece is a great venue for a holiday. There is a wonderful light and the people welcoming and friendly. The guy who asked for cash, was actually very kind and friendly. Personally I didn’t mind to go and get cash. But, when wearing an economist’s hat, I do have different view towards tax avoidance. 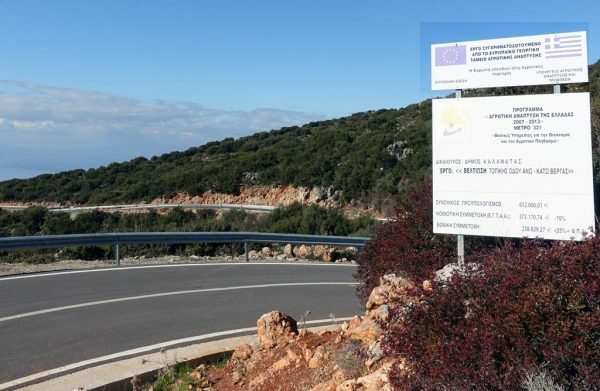 The other interesting thing was the sheer number of signs which showed a project was a joint project between the EU and Greece. 1) If only the EU spent a higher percentage of its budget on regional projects rather than giving transfers to large farms, it might have higher popularity. For all the suffering of the Euro-crisis, Greece is still in the EU, whilst the UK isn’t. I never got round to asking the Greeks what they thought of Europe / Euro. I didn’t really want to intrude on something that might bring up painful memories. There is nothing like going in with to help one understand. For us, who live in Greece, it is more than clear that the only serious problem is one of supply and never one of deficient demand (and how could it be in a small open economy ?). Just a few more visits to Greece and you, too, will see the light. For the time being, please note one statistic. The are 2.67 million “old age” retirees drawing a pension in Greece, out of nearly 11 million inhabitants. Talk of “aggregate demand” lagging “aggregate supply” ! Tax evasion is not the only reason people ask to get paid in cash. Cash withdrawals from bank accounts are limited to 420 euros per week. So, if your payment by card goes into the bank account of the merchant, it gets blocked. In effect, Greece is in a system of parallel currencies, the free euro and the blocked euro. The probable exchange rate is about 1.07 blocked euros for one free euro. So, if you paid cash to those extra nice Kalamata folks (reputed throughout Greece and the Greek diaspora to make excellent teachers and … pimps), you paid 7% more and, besides, helped tax and social security contributions evasion. 2 years ago we visited Greece (Greek island) and I struck up a conversation with a taxi driver. He said that he had been kindly left a large area of land by his late Uncle and that the Greek Authorities wanted land tax paid from the point of his Uncle’s death. He told the Authorities that he had no money, only his taxi income which had collapsed since 2008 and was insufficient to even meet his current obligations / support his family. So he told the authorities that they could have the land instead for free as he had no way to pay the taxes. The authorities refused! Instead they insisted that the taxes be repaid even though the taxi driver already had substantial bad & accruing debt. He said that he was told by them that they didn’t want the land as it generated no income for them, but because they were now able to book a theoretical income to their accounts, all was well with them, even though he had no way to pay and that the debt was inevitably a bad / onerous debt! He went on to say that he wished that Greece would return to the drachma as, despite its weakness, it enabled him & Greeks generally to put food on the table for his family and to avoid unplayable debts & that the Euro, despite its stability & wide acceptability was resulting in impoverishment. This is a chilling true life account of the tactics that a desperate Government will go to to look after their own finances at the expense of the people’s. I personally cannot ever see Greece & it’s people being self-sufficient again without (1) being free of the frankly daft restriction in the Maastricht Treaty limiting Govt’s to 3% deficit spending (especially when private sector GDP has collapsed) and (2) reintroducing an ability to control its own money supply, at least in the short / medium term via its own Central Bank & own printing press.